Support This Project – How Do U Feel? Thank you for joining our campaign to register and engage the 83% of eligible voters ages 18-24 who did not vote in the last election. 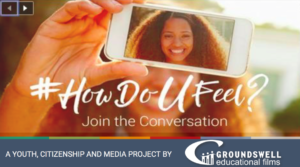 “HOW DO YOU FEEL?” social media campaign, poses daily questions on the website and social media as the topics surrounding the election evolve. Ultimately, amplifying the voices of college-age youth, engaging them in peer-led discussion about the 2016 election, and helping them to register and vote. Please help spread the word on social media.